We offer a broad range of screen rental for fairs, conventions, events, conferences, meetings, reveals, or official acts. We provide different kinds of plasma displays so you can find the one that fits your requirements, fulfilling all objectives of maximum visibility and definition for spectacular presentations. Our products fulfill different sizes and densities (4:3, 16:9, 16:10, and other formats. We also provide stands and platforms for these devices. Get the best results both inddor and outdoor, we may add lighting and sound effects to enhance your event. We also rent monitors for reduced audience presentations. Our audiovisual equipment is available to rent for short or long periods. Our service includes transport, installation, dismantling, and technician staff during the event. If you need more information or you cannot find the product you are looking for, our specialized team will advise you in everything you may need. If you need more information or you cannot find the product you are looking for, our specialized team will advise you in everything you may need. Our technicians will inform you about the best equipment tailored to your needs. Our services include transport and build up in the location of your choice, plus an on-site technician for support service during the event. 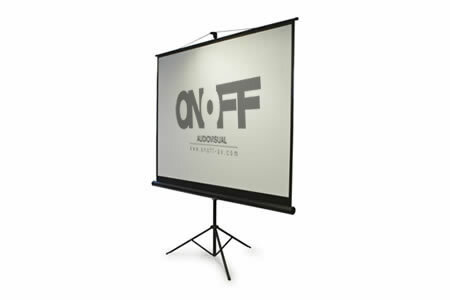 OnOff is a specialist audiovisual supplier for all kinds of events. We guarantee a perfect performance in all our products.